The drop-down menu from my previous searches popped up, it included some rather embarrassing websites. ‘For research purposes, I swear.’ Even though this was true my face quickly turned a shade of Coca-Cola can red. This is a risk you wear as a writer. Of course your search it is all in the name of research and sometimes, actually most of the time, the findings are unusual, gruesome and macabre. You live in constant fear that you computer may be monitored by ASIO! I recently wrote a short-story for university that had semi-violent, sexual undertones. There were frequent occasions when my kids or husband would pass by trying to catch a glance at my screen and like my teenager on social media, I would quickly hit ‘command, tab’ to change to another screen. ‘Nothing, just checking my emails…’ I would lie as I tried to unsee such images as: sadistic killer; a beaten homeless woman; an abandoned baby; and a photo of a murder victim. As a writer, you gain an incredible insight into human behaviour. When inventing a character I draw on personal experiences, and of course (unbeknown to my friends and family) people I know. When this is not enough I turn to Google. One click and I can discover so much, often too much. On a lighter note, I love to write with a humorous spin and have had many laugh-out-loud moments at the images, stories and the blog posts that I come across. A great feature on Word Press is that they provide the list of search terms that bring users to a blog. So it is with this in mind that I must share the most unusual search terms that have brought people to my blog… Should I be alarmed? Surely it was all in the name of research! What are some of the unusual search terms used to find your blog? OMG! that really had me laughing out loud. Is this any reflection on us!!! Fun post! All of my search terms are mundane. Which makes me realize I’m doing it wrong! Actually, I’m just doing me. And one of the search terms I have is ‘To thine own self be true’ so I’ll keep doing that. But! When an odd search term finally shows up, I’ll think of this post. Love these! I’m missing out here. I think I need to actually figure out the SEO thing. 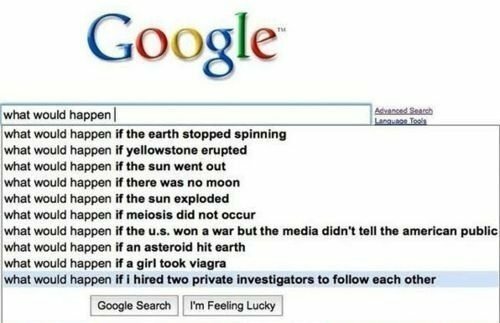 Ha ha … I need to get doing some research!